Bring fresh experiences that inspire joy, creativity and curiosity to your audiences through immersive, attendance-driving traveling exhibitions. Topics range from STEAM to Social-Emotional Learning to classic characters that will resonate with audiences of all ages. Like Pulitzer Prize winning humorist and inventor, Rube Goldberg, visitors can activate and create crazy chain-reaction contraptions that use everyday objects to complete simple tasks in the most over-complicated, inefficient and hilarious ways possible! Rube Goldberg machines are many things, but they aren’t perfect. Find the fun in failure as you step into the role of illustrator, storyteller and inventor. Visitors are invited into the imagination, whimsy, and humor of Mo Willems. Activities will give children the opportunity to make art that is inspired by Mo Willems, and to learn about the rich social and emotional lives of the author’s characters. 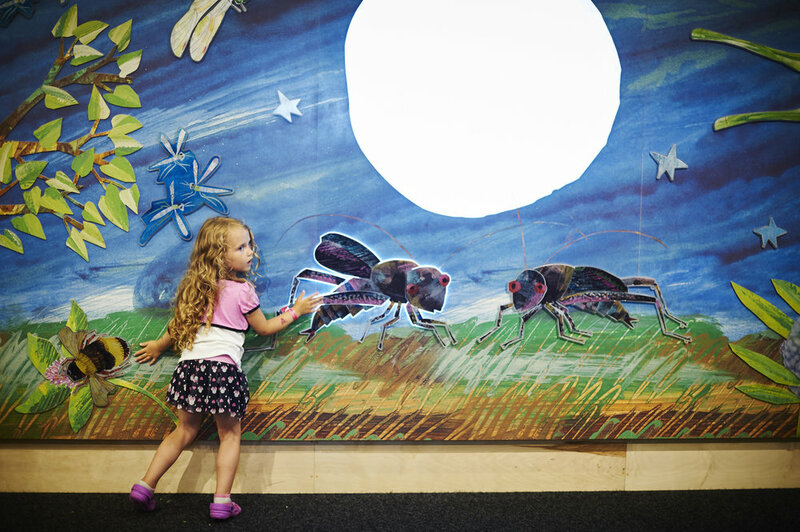 Step into the pages of your favorite books by Eric Carle! Experience the books from the perspectives of the Artist, the Reader, and the Character who inhabits his five Very Series Books. You will enter the distinctive landscapes imagined by Carle. Step into Daniel Tiger's world and join him and his friends as you explore the Neighborhood. Visitors will work together to solve problems, use their imaginations, and play along with Daniel's singable strategies to learn life's little lessons. Explore an exhibit about feelings. Visitors will play, act silly, and consider what makes them sad, mad and happy. Visitors will asks questions, listen, and learn about themselves and the people around them. This exhibit encourages visitors to take a deep breath and explore these feelings. Measurement is an essential part of our lives, but not always easy to understand. Gauge height, distance, mass and time using traditional - and not-so-traditional - tools and units. Learn the language of measurement and work with others to become a measuring wizard. Every object in our world has a story of how it is made. How People Make Things tells that story by showing you the ways in which familiar childhood objects are manufactured, and the people, ideas and technology used to transform raw materials into finished products.